In 1982 as a doctoral student assigned to see couples for therapy in a clinic setting, Sue Johnson, PhD, now a professor of clinical psychology at the University of Ottawa, “was appalled by how much pain people were in” and “the huge emotional drama.” She found herself unprepared to deal with the couples, especially those who were overly angry or those who were distant and had shut down. As a result, she set out to find a way to help these people. “Couples were caught in dreadful dances of negative interactions, and even though they could tell you what was happening on a cognitive level, they would still get swept up in unfolding, spiraling dramas with one person making demands and one person withdrawing,” Johnson explains. Struggling to understand what was going on in her sessions, she began taping them. Later, she searched the tapes for clues about what worked and what didn’t. Gradually, she came to believe that the answer was related to what John Bowlby had described as attachment theory. This insight led her to develop emotionally focused therapy (EFT). Emotional bonding is part of our heritage and a basis of our survival; it is one of our deepest human instincts. We want to matter to other people, and we need safe emotional connections. Johnson began to realize how the need for attachment was playing out with the couples she was seeing. “It was all about emotional bonding and the pain people get into when they cannot reach their attachment figures,” she explains. Around this time, social psychologist Philip Shaver and others began talking about adult bonds and extending the ideas of attachment theory to romantic relationships. “The whole idea of adult bonding took off. And EFT took off along with it,” Johnson says. Marion Bogo, MSW, RSW, Adv Dip SW, a professor in the School of Social Work at the University of Toronto, has written about EFT. 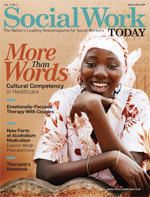 Central to EFT and also a key in social work practice are the couple’s strengths, she explains. EFT provides social workers with a theoretical attachment perspective to examine the strengths underlying the negative communication they see in couples. “In EFT, you take behavior that on the outside looks provocative, negative, and outrageous, and you reframe it in terms of a person’s best efforts to get their needs for connection and attachment met.” The “howl for connection” is how Johnson describes this dynamic. “Certain ways that we dance in close, loving relationships create safe attachments,” explains Johnson. These emotional bonds are a wellspring of strength. Once social workers understand that emotional bonds are a source of strength that can be positively built on, they are able to move in new directions with couples. “You are able to help couples understand that they have strengths that they are not even aware of, and this helps them to work on their deepest problems,” explains Tim Sweeney, LCSW, who has been in private practice in Fairfax, VA, for eight years and uses EFT. But if a couple is not in tune, asking those questions can be troublesome. The signals they send can be distorted and misinterpreted, with no easy response. They are caught in a trap familiar to social workers who have worked within a dysfunctional system: A miscommunication on the part of one person causes an inappropriate reaction from the other, which can lead to escalating behaviors. Social workers can intervene and create positive change to refocus the system if they are able to correctly interpret a couple’s code, and EFT may help them do this. Understanding what people need and fear and the importance of emotional responsiveness in the dynamic of attachment has been transformative in Johnson’s ability to work with couples. “Responsiveness is so powerful; it’s the most powerful thing in the room when working with a couple. It’s much more powerful than teaching people communication skills that they can’t use anyway when hot emotions come up,” she says. Johnson notes that every couple experiences missteps concerning their relationship. Relationships start with an intense connection but, over time, the level of attentiveness to one another naturally drops off, creating a feeling that the connection has been damaged. If the couple can’t successfully reconnect, “demon dialogues” are likely to occur. These fights can become standard in some relationships, but if they gain momentum, they can take over, resulting in a devastating feeling of aloneness. EFT may offer a road map to help couples understand how to self-correct when their “attachment demons” surface. Our attachments are so powerful that our brains code them as “safety.” Any perceived distance or separation in our close relationships is interpreted as danger because losing the connection to a loved one jeopardizes our sense of security. A primal fear ensues, setting off an alarm in our amygdala—the fear center of the brain. Once the amygdala is activated, we leap to action. This fight-or-flight response is what Johnson says occurs in relationships where people are either angry with one another or are withdrawing in response to a perceived challenge to their sense of attachment. Jill Bolte Taylor, PhD, a neuroscientist who has written a new book about surviving a stroke, My Stroke of Insight, explains that the amygdala, located in the limbic system, is always on guard, scanning incoming information to determine the level of safety. “When incoming stimulation is familiar, the amygdala is calm, and the adjacently positioned hippocampus is capable of learning and memorizing new information. However, as soon as the amygdala is triggered by unfamiliar or perhaps threatening stimulation, it raises the brain’s level of anxiety and focuses the mind’s attention on the immediate situation. Attention is shifted from the hippocampus and focused toward self-preserving behavior in the present moment,” she explains. Taylor observes how neuroscience validates EFT: “Throughout our lifetimes, our limbic systems do not mature. As a result, when our emotional ‘buttons’ are pushed, we retain the ability to react to incoming stimulation as though we were 2 year olds, even when we are adults.” Thus, our perception of attachment as a way to stay safe, which so carefully developed as children, will be triggered under any perceived threat when we are mature adults. EFT can provide social workers with a structure that includes three phases and nine steps (see sidebar). “You always know where you are, and there is always something you can do based on where you are in the process,” explains Sweeney. Beth Levine, LCSW-C, a private practitioner in Rockville, MD, agrees: “It offers a road map for understanding human relationships.” Levine likes the metaphor of a Jackson Pollack painting: Working with a couple is messy and complicated. Without a theory, you can’t see the one thread that ties the picture together. EFT gives you an idea of where to go and what to do. Sweeney worked with a couple that had so given up on their marriage by the time they showed up in his office that each partner already had an attorney. Using EFT, he helped them quickly see how there was an issue of safety and respect in their relationship. There was a 3-year-old child involved, and the couple was anguished about the effect of a divorce on the child. “They started trying really hard to interact with each other with safety and respect in their minds,” Sweeney says. After about 12 sessions, they fired their attorneys, the husband was transferred to the West Coast, and, after they moved, they were referred to an EFT therapist there to finish the consolidation step. “I didn’t have hope when they came in. They both had attorneys and were seeing red,” Sweeney notes. Stephen McDonnell, LICSW, a private practitioner in Washington, DC, has used EFT to quickly deescalate couples. He explains that the EFT model is “counterintuitive.” Instead of engaging the blamer, the therapist engages the partner who is disengaged. Intuitively, the therapist would typically want to calm down the blamer, but the EFT process does the opposite. It encourages the therapist to reengage the disengaged partner first, bringing him or her into the dialogue. Social workers are used to dealing with crises, which is why they may be drawn to the person who is angry. EFT helps social workers see that the quieter, avoidant person is also in distress. EFT has also been shown as an effective treatment for couples and families dealing with sexual abuse histories, depression, grief, chronic illness management, eating disorders, and posttraumatic stress disorder. “We understand that if we can help a couple create a safe emotional bond, then every time a huge stressor comes towards you, you can reach for each other and support each other. Not only does that help you to deal with the stressor, but it cements your bond,” Johnson says. Emotion and bonding are universal, she adds. EFT has been shown to be equally effective across cultures, with traditional couples, with those who are educated and noneducated, and with gay couples. Emotion may be expressed differently in these varying situations, but the process is the same. It has been more than 25 years since Johnson first faced couples suffering the pain of emotional disconnection. She says at that time, people would just walk out when she tried to talk about emotions. “It wasn’t popular then,” she says. Now, people are being trained to be EFT therapists all over the world. They are breaking new ground every day. EFT is being used with individuals and families and with trauma survivors. Some of the most exciting work is being done with soldiers and their wives. “They face amazing stressors in relationships. I am just in awe of those families and couples and the stressors they face and how they try so hard to serve communities and countries and hang on to their relationships,” says Johnson.